Handmade Love: Dori… the polymer clay lady! Valentine’s day passed and I hope you had a great time! Of course I truly believe that everyday should celebrate Valentine’s day! We can and we must celebrate every kind of love continuously! Love for our men or women, for the kids, for the nature, for friends….and love for handmade! Anything handmade, since it is something that we create with love, passion and imagination! So today I am honored to have a great etsy friend in my blog. Please let me introduce you Dori from HunkiiDorii!!!! She might be an “etsy” friend but I always felt that I know her from the past. She is a lady with a girly heart, always optimistic, a nature and life lover and always having a great smile. A lady like her, could not create something less of masterpieces. I tried hard to select a few photos with her creations to post here, but to be honest, I love all of her creations. One of a kind polymer clay creations! Here is a small interview of Dori. Hi all, this is Dori from Budapest, Hungary. Anyway, polymer clay is my material of choice for the time being, probably because it is so versatile and isn’t as time-consuming as working with many other materials. Although that is not entirely true, but maybe what I mean is that it can be left alone for a while before actually finishing it, and still see some results (such as pieces of a necklace or beads or tiles for instance). I also like it that if I’m not happy with what I’ve just made I can start again. I’ve always had this dread of either not being able to finish a piece (for instance when I sewed) or creating something I didn’t like. And then what? :O This is totally the nature of things and that is how we all learn, so I shouldn’t be so squeamish about it but I am, and with clay this feeling is somewhat lessened. The reason why I do it is actually because I love doing it :D. And I sell or give away the pieces because first of all, I couldn’t afford all that raw material (clay is pretty expensive, and so is electricity) and tools and things, and secondly, I have no room to store it all. Plus – and not the least at all – I love it that others like what I make, too. I have quite a lot of self-doubt, especially about certain pieces, but when I have a piece that I really like and others do, too, that is such a great feeling. 3. I don’t like grumpy people (except Grumpy Cat :D) so when I see one I will them to be happy. And they usually obey, the unsuspecting muggles! 4. I buy loads of hand lotion because I need to wash my hands all the time while claying and the water makes them dry. 6. I’m a spinning top. But sometimes a spinning top needs its rest, too. 7. I teach English to adults. 8. I once made one of my adult groups create marzipan figurines to illustrate a story we were listening to. I’d been a bit nervous they wouldn’t want to but they enjoyed it more than me! Then I ate all their creations. So in order to have the chance to win this beautiful necklace, just use the Rafflecopter below and earn more entries. Amazing work!Thank you for this giveaway! 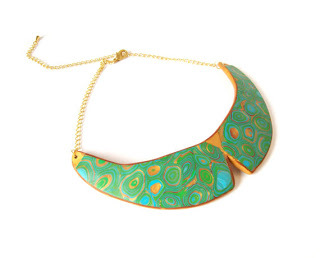 I love this one: http://www.etsy.com/listing/107510109/collar-bib-statement-necklace-green? And my favourite is this one!! my favourite item is http://www.etsy.com/listing/119145115/snowflakes-dangle-post-earrings-white? 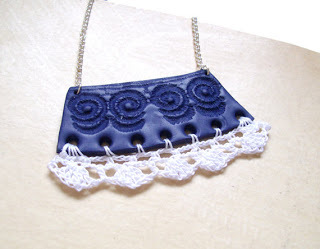 The crochet clay bib is my favourite!I love blue and crochet!AriadnefromGreece! I love all items on her shop. 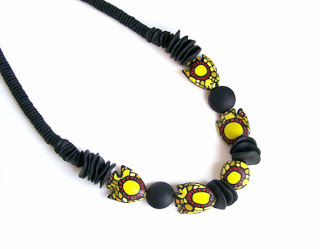 But my favorite is this http://www.etsy.com/listing/102699207/polymer-clay-bib-necklace-pink-yellow? Amazing work from an amazing crafter! Love you both for this great giveaway! Great artist! I love the combination of polymer clay with lace like in this piece: http://www.etsy.com/listing/104768400/lacy-bib-necklace-red-white-crochet-two? Thanks for the opportunity to win one of the lovely creations and thanks for sharing Zina! i think the blue and white braided pendant is my fav. I love everything, but my fave is the Blue-white braided pendant necklace navy blue polymer clay braided necklace nautical small fashion necklace! great creations and sweet interview! It's so beautiful, i like it a lot! Dori is amazing, thank you Zina for the giveaway! I mostly loved the Spikes!! http://www.etsy.com/listing/109911436/large-statement-necklace-spikes-chunky? Thanks you Zina and Dori! Amazing creations by the SO talented Dori!! I love this giveaway for many reasons! One of which is the friendship between Dori and Zina. The second is the prize! I love it!!!! I really like this http://www.etsy.com/listing/119145288/icicles-dangle-earrings-white-and-silver? I love the large statement necklace "Spikes"
Love the Collar bib statement necklace Green turquoise gold art deco art nouveau inspired polymer clay choker necklace Klimt-inspired. 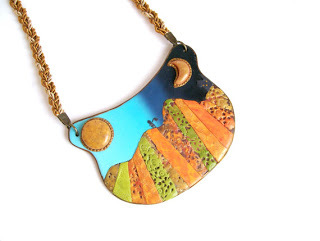 I love this one http://www.etsy.com/listing/107510109/collar-bib-statement-necklace-green?